Saturday was another two hill climbs promoted by Holme Valley Wheelers (Holme Moss) and Huddersfield Star Wheelers (Jackson Bridge). It was deep in the heartland of Yorkshire hill climb country. As Simon Warren once said in his hill climb book, throw an arrow at a map around this neck of the woods, and you’ll probably land on a decent hill climb. They don’t really do flat roads her, but they do have plenty of 20% gradients. I’d never ridden either climb before, but was lured up north by the prospect of Holme Moss and the chance to compete in the Granville Sydney Memorial hill climb. Holme Moss in better days. 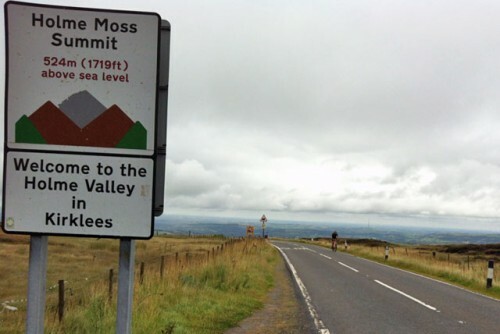 Next year the Tour de France will be flying up Holme Moss, watched by a global TV audience of millions and 100,000s of spectators by the road side. It was a slightly different set up this weekend, but fundamentally both events do involve cycling up a hill until it hurts really quite a lot. The Indian summer has well and truly finished. We are now being treated to a very English autumn. It was one of those days where there was a perpetual drizzle. Not ideal conditions for a double hill climb; I came back with a car full of wet stuff. But, they are made of stern stuff up this part of the world. I didn’t see many dns. I guess, if you’re going to do a hill climb, a light drizzle is the least of your concerns. The drawback of the alternative hill climb course was that it was significantly shorter than Holme Moss. This year I’ve studiously avoided entering any hill climb where the course record is less than 3.30. But, fate wasn’t going to allow me to get away with it. This was, to all intents and purposes a 2 minute hill climb – shorter even than the rake. After a wet and soggy marmite sandwich it was back to the Fleece for a cup of tea, before heading off to the Old Red Lion in Jackson Bridge for part two. Jackson Bridge was misty at the top, but it was OK to race. This is a real brute of a climb – a real hill climb classic. You start off with a wonderful 20% hairpin to throw you into the red, but they you still have nearly another mile to go to the finish. In true Yorkshire fashion there’s no steady gradient, just plenty of ramps and tight corners. It require a bit of pacing and measured effort, before the final stretch to the line. Jeff Wright holds the course record with a slightly crazy 3.49. He set that record to win his only national hill climb championship in 1994. Jeff Wright was a super fast hill climber (who came 2nd – six times), he only had the misfortune to come up against even crazier fast hill climbers like Stuart Dangerfield, Jim Henderson and Chris Boardman. But, if anyone does 3.49 up Jackson Bridge they have really earnt a national hill climb championship and more. I managed a 4.18. – One of the quickest for a few years, on a day that was less than ideal. Off the top of my head, Matt Clinton was second, and Josh Teasdale was 3rd. 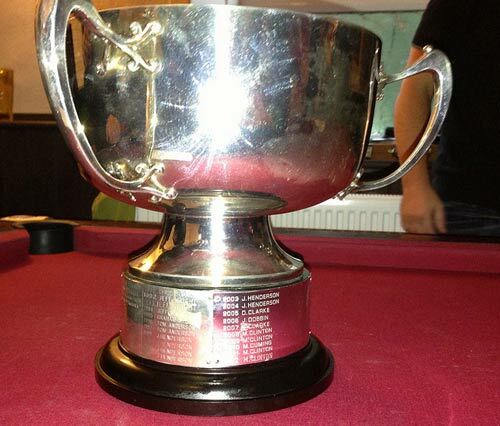 In the pool room of the Old Red Lion, I had a look at the great Granville Sydney Memorial Trophy. It was too valuable to sling in the back of the car and dump on an Oxford mantelpiece, but I took a photo of the previous winners and received a replica trophy. Much thanks to organisers and marshals from both Huddersfield Star Wheelers and Holme Valley Wheelers. It wasn’t an ideal day for standing on the road in a persistent drizzle (that soaks you through). 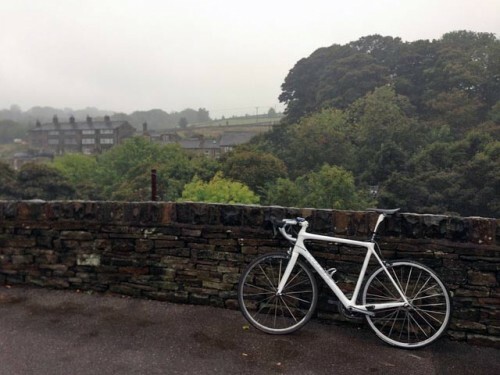 The 2015 national hill climb championship will be held on Jackson Bridge and organised by the Yorkshire Cycling Federation. I really like the Jackson bridge climb, it’s a proper challenge. Jim wright’s time is Barry; even Jim Henderson doffs his cap to that one. Huddersfield star wheelers are very much part of the fabric of hill climbing. With Granville and graham leading, assisted by Dave petroykus and Adrian hinchcliffe, they won the team prize regularly during the late 60s and 70s. I like to think of them as the forerunner of the Blackburn outfit; stott, helliwell, etc. Was Matt on fixed? It’s a good one for fixed, despite the changes in gradient. Don’t think Matt was on fixed, but I didn’t see. After then it’s the Buxton Boys: Lee Baldwin, Sam Clarke, Chris Baines and Sam mansfiled, and they’ve got BB as well now! The Ashley were aiming to win the ‘unsponsored’ team prize this year – but it appaers that there isn’t one! Oops that was meant to say Mansfield!